In this article I’m going to take you with me on my typical day as a case manager. I say ‘typical’, but any case manger knows this doesn’t really exist in our daily lives! Every day presents me with a new challenge, but I’ll never get tired of finding solutions to improving the wellbeing of my clients. Hi, my name is Linsey and I work as a case manager for AJ Case Management. I am a qualified teacher with a wide range of experience supporting young people with complex disabilities. Over the past six years I have worked as a Personal Learning Co-ordinator for clients with a wide range of complex disabilities, including those who have experienced traumatic brain injuries, early childhood trauma and have significant mental health difficulties such as clinical depression, severe anxiety and OCD. Now the formal part is over and done with, I’d like to share with you the goals that I try to achieve in my everyday work. After you’ve got a better understanding of what I am trying to achieve in my job, I’ll begin with my case management routine. Although there is no ‘typical’ or ‘normal’ day in my profession, there are a handful of tasks and goals that work their way into my routine quite frequently. Respond to the 15 emails I received overnight – The emails are never-ending but they’re full of the super important information I need to support my clients. I can’t risk missing even just one, so this is a thorough job every morning. Return all the voicemails I received after 5pm – Life doesn’t go on hold for my clients when I clock off, so I always need to take time in the morning to catch up with the previous evenings events. Attend appointments with clients to see consultants – It sometimes feels like there aren’t enough hours in the day for all the appointments I need to attend, but I rely on my time management skills to make sure I’m exactly where I need to be. Liaise with the multi-disciplinary team – So many professionals work together to deliver a care plan, including psychiatrists, therapists, neuropsychologists and counsellors. Regular meetings are important to make sure we’re all in agreement of the best rehabilitation plan. Update the client and family on outstanding issues – Communication is key, so I always make sure the client and their family are up to date with issues surrounding care and rehabilitation. Liaise with the Financial Deputy regarding purchasing recommended equipment – New medical equipment is often a big investment, so plenty of consideration and collaboration is needed to make sure we’re making the right decision. Plan my diary for the following week to include the update report for the legal team – In certain cases I work closely with legal teams and I need to make sure they’re up to date with the latest reports and findings. Plan in some continuous professional development time for upcoming week – You never stop learning as a case manager. Allowing time for professional development is vital for succeeding in this role. Update daily notes – Remember when I mentioned emails are never ending? The same goes for note taking. There is a lot of important information and data to remember and I don’t think my memory could handle it all, so I jot it all down in my trusty notepad. So, how are these tasks put into practice? 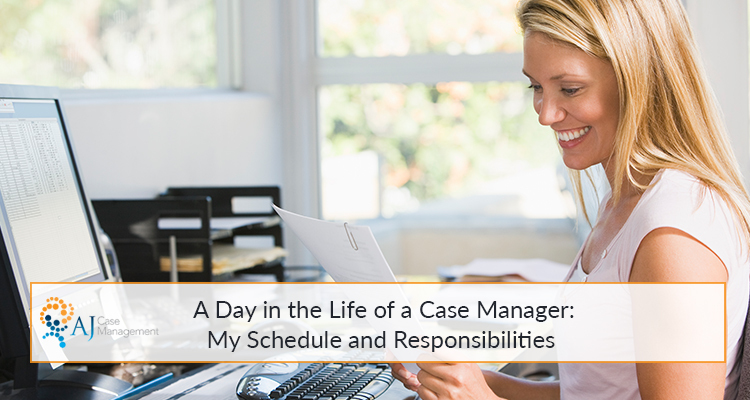 And, what does a real day look like for a case manager? I reach for my phone, turn off the alarm and kick off the duvet. I go to the bathroom and start brushing my teeth to see my dog has kindly joined me. I know exactly what those puppy eyes are asking for, so I get ready to take him for a brisk walk. Once I’m home, I make myself a cup of coffee and some toast. I switch on the news, take a sip of my delicious coffee and open Twitter to see the interactions with the @AJCaseMx page. I enjoy having time in the morning to relax and it puts me in a great mood for the day. Once I’ve had breakfast, caught up on the news and updated the AJCM social pages, it’s time to start my commute. I arrive in the building and I’m greeted with friendly smiles and a warm ‘good morning!’ from the office team. Case managers are in and out of the office as they have appointments and meetings to attend, so I catch up with those who are in today. Once I’ve made myself a drink and sat down at my computer, the work beings. I use my attentive skills to carefully read each email I received out of my working hours. I take however long I need to respond to the emails and make sure that everyone has the right information they need from me. Once I’m happy that I’m up to date with emails, I move on to analysing my calendar. This is where my planning skills come into practice, as this is a huge part of the role. Ensuring I leave enough time for appointments and making sure care plans are following the right schedule is essential. I familiarise myself with the tasks I have booked in and plan out how I want my day to unfold. It’s time to dig out the files and review the cases I’m working on at the moment. By ‘caseload’, I’m referring to the number of cases I’m dealing with currently. This requires skills such as critical thinking, decision making, careful judgement and risk assessment. I monitor the current progress of my clients and plan ahead for the next steps. I alter any care plans that need updating, as various challenges can change a care plan several times throughout rehabilitation. Once I know where I need to go with my clients and their care, I need to prioritise. Calling families, professionals and support workers may be required to find out which tasks have the highest priority. In front of me I now have a spreadsheet of tasks, appointments, phone calls, meetings and routines I need to complete. Let’s get started! This is when I make time to call my clients and check in with them. A client with a traumatic brain injury that I have been working with for a few months had their first physiotherapy session yesterday, so I am eager to see how it went. I use these phone calls to track progress, make notes, offer support and my expert advice. I never know what to expect from these calls, so I always go into this task with an open mind. One person may have taken their first steps since their accident, whilst another might inform me that they are too anxious to attend their counselling session. Whatever the conversation, I use my knowledge and Person-Centred Approach to find the best solution and ensure that the client feels fully supported. Phone calls may also extend to medical professionals and team leaders to further track progress and rehabilitation. I’m talking and typing faster than I ever knew I could to capture all the incoming information, sometimes I think case managers are the world’s best multi-taskers! Once I’ve ticked off the list of phone calls I needed to make, I refer back to my calendar. Reading the notes I made, I add in appointments, meetings, research and other tasks that I need to schedule in. I sit down in the break-out area and take a deep breath. I’ve got a lot on my mind, but I try to clear my head and take some time to unwind. Zesty salmon salad is todays lunch (which I prepared last night, organisation is key!). I’ve packed it full of avocado, tomatoes, rocket and fresh salmon to give my brain the boost it needs. I leisurely enjoy my lunch whilst I catch up with friends and family on social media. There’s always amusing dog or baby videos that my family shares to put a smile on my face. Cake is essential in the AJCM office, so I enjoy a slice of Victoria sponge with my fellow colleagues whilst we have a chat.